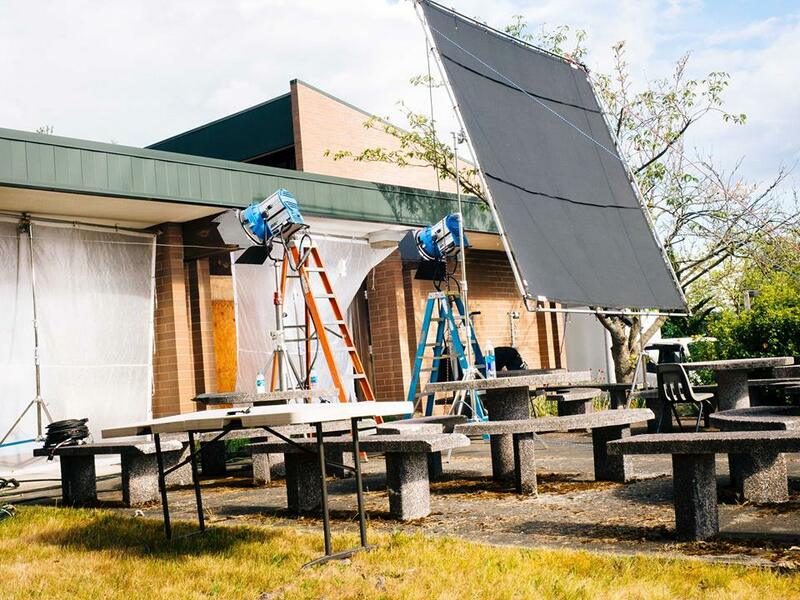 Shoreline just keeps on getting more film projects. Here are some shots from a commercial that was filmed at the Fircrest Residential Habilitation facility earlier this month. We had roughly 60 people on site for two days, hailing from LA, NYC, London, and of course Seattle and Shoreline. There were actors, camera operators, sound folks, wardrobe, makeup, grips, etc, etc. This was a full fledged operation .... all just to make one 30 second advertisement and one 60 second advertisement... but with very high production values. Cool stuff. After shooting at Fircrest, the team then relocated to the Shoreline Center athletic field for some additional outside shots .... and then to other points around Puget Sound, including the football field at UW. Shoreline Rotary is starting a new chapter in its life of service this Wednesday morning at 7:00am. Or maybe it could be called a restoration or perhaps a reunification as two of the Rotary Clubs of Shoreline reunite into one club called simply, Shoreline Rotary. The Noon Rotary Club, originally chartered in 1962, is merging with the Morning Rotary Club which was sponsored by the Noon Club in 1994, to create a new club with close to 60 members. For those who may not know much about Rotary, it is one of the largest and oldest service clubs in the world with a motto of “service above self”. With over 1.2 million members worldwide, Rotarians serve in their local communities, their geographical areas, and around the world. These two Shoreline area Rotary Clubs have a long history of service. The Rotary Cup is presented by Rotary to the winner of the annual Shorecrest/Shorewood football game? Rotary is caring, giving, and helping others to live out their dreams. Rotary is volunteers who think more about others than they do about themselves. Now two of the Shoreline Rotary Clubs are coming together to better serve our community and the world. Check out our web page. Maybe Rotary is what you’ve been looking for as a way to serve your community. 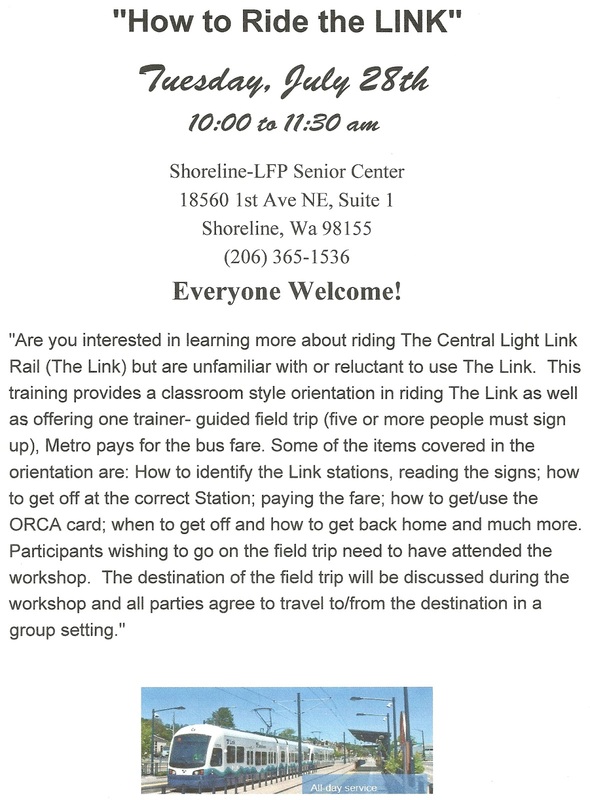 The Shoreline Rotary meets Wednesday mornings at 7:00am in the Spartan Room at the north end of the Shoreline Center, 18560 1st Avenue NE, Shoreline. Visitors are always welcome. Featured speaker at the kick off meeting on July 1 for the new club will be Washington State Attorney General Bob Ferguson. Ron was born March 15, 1940, in Seattle, Washington and passed away on June 16, 2015. He grew up in Edmonds and, after graduating from the University of Washington with an accounting major, enjoyed decades of serving clients at Hansen / McLaughlin. Service to the community and love of his family defined his life. 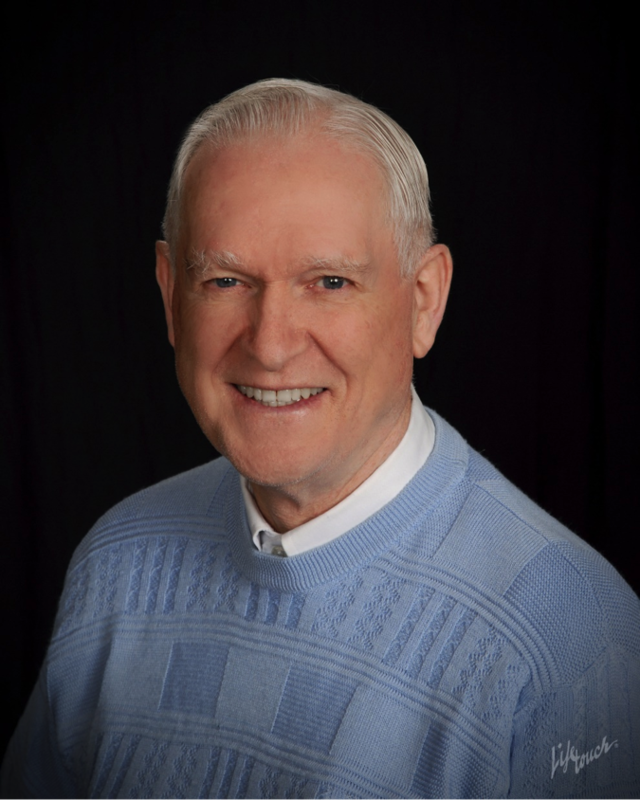 Ron was a founding Councilmember and a Mayor of the City of Shoreline. He was a board member of Shoreline Community College Foundation, Suburban Cities Association, the Puget Sound Regional Council, and Shoreline Rotary Foundation. He served terms as president for Sno-King Kiwanis and the Rotary Club of Shoreline. He is survived by Jan, his college sweetheart and wife of 51 years; son Byron; daughters Stephanie and Karen (husband Greg Greeley); and granddaughters Megan, Katie, and Julia. Ron lived his faith and was a part of the Shoreline Community Church where services will be held on July 11th at 1pm with a 2pm reception at Shoreline City Hall. In lieu of flowers, memorials may be made to the Shoreline Rotary Foundation. Volunteers are still needed to help the kids at Camp Ballinger this summer from July 7 through August 13. Even a few hours a week can make a big difference - just in letting the kids know that people care about what happens to them. And - you might have fun! 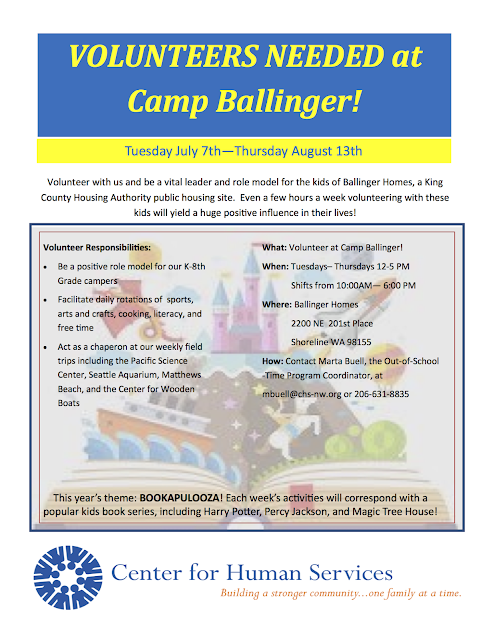 Contact Marta Buell, 206-631-8835 for more information. A class in how to ride the LINK will be offered at the Shoreline Lake Forest Park Senior Center on Tuesday, July 28 from 10 to 11:30am. Everyone is welcome and it is not necessary to sign up in advance. 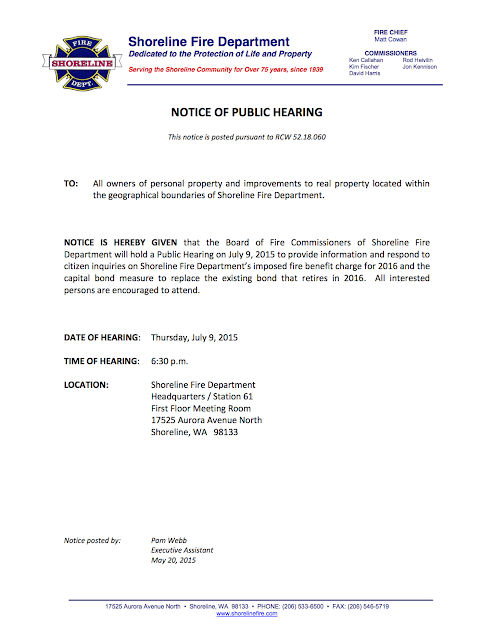 Shoreline Library Board meeting on Thursday, July 2, 2015 at 6:30-8:00pm, Shoreline Library, 345 NE 175th. A subcommittee of the Shoreline Library Board is working on the wording of a letter to the King County Library System proposing an increase in library services to accommodate anticipated high density housing resulting from the rezoning of neighborhoods currently served by the two existing libraries. They are working to understand existing long-range plans, how they as the Library Board and Shoreline libraries (Shoreline and Richmond Beach) fit into the Light Rail subarea planning process, and the most effective way to be involved. 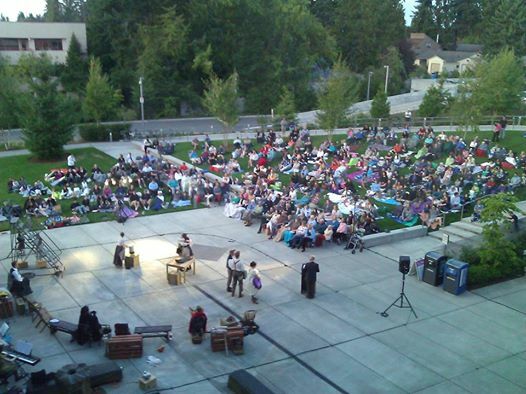 Pack some snacks and head on down to Lynndale Park (18927 72nd Ave W, Lynnwood) for an evening of Shakespeare performed by professional theater troupes Wooden O and GreenStage. Perfect for the whole family - rain or shine - in the renovated amphitheater. The amphitheater is ADA accessible and a great place for all visitors to enjoy an evening of theater in a quaint, wooded environment. The first of six free performances will begin at 7pm, Wednesday, July 15. Join us on Opening Night for Henry IV performed by Wooden O sponsored by Molina Healthcare and Community Transit's Curb the Congestion. Enjoy five more performances throughout the summer at the Lynndale Park Amphitheater. All performances begin at 7pm and are free (suggested donation $5). The Pacific Little League's Pacific Cafe will be open from 4:30 - 8:30pm each performance night for those who would like to purchase a hot meal or snack. 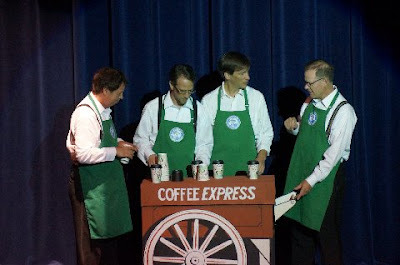 The cafe accepts cash or credit and all proceeds benefit the Pacific Little League Program. 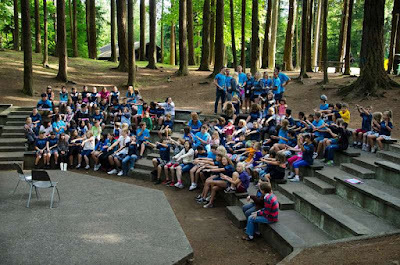 Lynndale Park is a large park featuring native forest, athletic fields and courts, a skate park, a playground and trails, as well as the amphitheater 18927 72nd Ave W, Lynnwood, WA 98036, Phone 425-670-5000. King County Metro Transit bus routes will operate with a Sunday schedule Friday, July 3, in observance of Independence Day, and operate Saturday service levels on Saturday, July 4. During the holiday weekend, many routes will be redirected around community celebrations around the county. Changes also are in store for the King County water taxis. The family of missing Shoreline student Michael Sutherland is no longer following the theory of his being lost on a local trail. The family has no solid information about where Michael Sutherland may be after Friday night, so they are keeping ALL OPTIONS open in the Shoreline and Greater Seattle area. He was last seen on Friday night at his home in Shoreline. He did not bring his ID, debit cards or wallet with him. His phone has been off/inactive since Friday night also around midnight. Reports from the community, all of which are unconfirmed, report sightings in Capitol Hill, Rainier Valley, Alki, and downtown Seattle. My family is asking everyone to keep searching, posting flyers, and talking with anyone they can. We have yet to find any concrete information, but participation from the public and friends has proved invaluable. We are hopeful. We are asking people to call myself (Erin, Mike's sister) at 206-450-7836 or the King County Sheriff's office 9-1-1. We have a Facebook page called "Find Mike Sutherland" we are posting any and all information there, including possible sightings as we hear them from the public. We love Michael very much, and want him home safe. Please post or forward the flyer on social media, and around the Seattle area. Today, House Bill 1842, a bill to improve the efficiency and coordination of transit in and around the Puget Sound region passed out of the legislature with unanimous support. 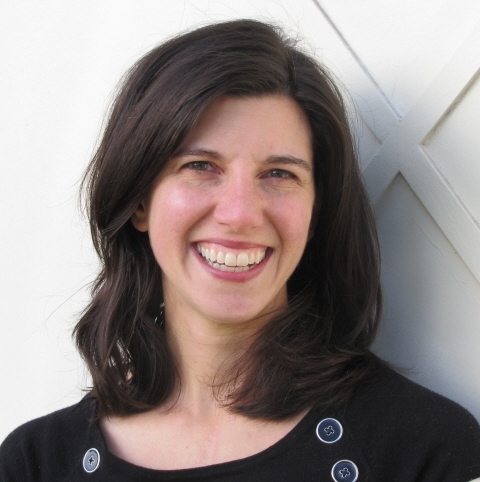 The bill was sponsored by Rep. Jessyn Farrell, D-46, Vice Chair of the House Transportation Committee. I noticed one petunia plant was looking somewhat frail. And while I'm at it, why not add a bit around the roses. 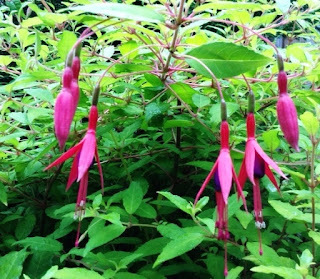 I watered the hydrangeas and the fuchsias too. Pretty soon I realized there was quite a bit to do. And the wilted hosta was something of a shock. There will be lots of time tomorrow for me to get the mail. Fireworks are legal in unincorporated Snohomish County, but that's the only place for miles around. Every city and town around us has banned fireworks. Don't even think about it. Shoreline, Kenmore, Edmonds, Mountlake Terrace, Lynnwood, Seattle, Everett. Lake Forest Park even put up signs at the city limits. What was the name of that legal firework that spins in crazy spirals and lands up to 25 feet away from where it started? I watched one land in the middle of a hedge. If they land on roofs they can smolder for hours until they set your roof on fire. Conditions are drier than they have been for years. Easy to set the lawn on fire. There's a lot of talk about honoring veterans for their service. One of the most practical ways would be not to kick in their PTSD with explosives. Most dogs are terrified of the sounds made by fireworks. At best, they will cower under the bed. At worst, they have to be medicated and I'm told that some are still traumatized. Many try to run away from the sound and get lost or hit by a car. It's better these days, but I remember years when I couldn't get out of my neighborhood without running over piles of debris from fireworks. Even if people tried to clean up, they couldn't see everything in the dark. There were always pointy pieces of metal in the debris, which I'm sure didn't do my tires any good. There are always the stories every year about guys lighting fireworks in cars and throwing them out of the windows - until they fumble one and blow off a few fingers. And the people who go to check why the firework didn't go off and find out it was just delayed a little. Oops. Don't even think about Sky Lanterns. So lovely to see them floating away and not so lovely when fire falls from the sky. Even where it's legal, there are a lot of limitations. Not on school or church property. Not on any private property. Not in parks, or city streets. Doesn't leave much. Citizens have been petitioning the County Council to make the ban county-wide - or at least in unincorporated Sno County. So far, the County seems to be ignoring them. Darrell Beetham, Past President and Marc, exchange student from Germany. As of Wednesday, July 1, the Shoreline Breakfast Rotary and the Shoreline Lunch Rotary will combine their clubs. Meetings will be at breakfast, under new president Randal Southam, past president Darrell Beetham, and vice-president Bill MacCully. The kick off meeting on July 1 will feature Washington State Attorney General Bob Ferguson. 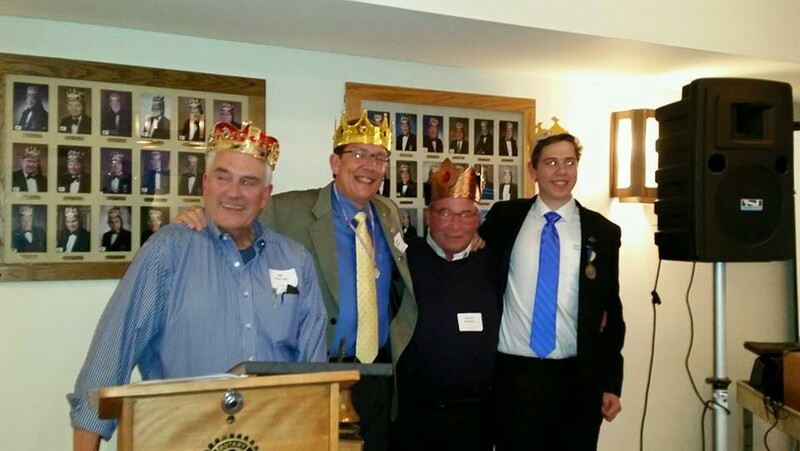 The clubs celebrated with an installation of officers last week. The other two clubs in the area are Rain City Rotary and Lake Forest Park Rotary. With the statewide drought declared by Governor Inslee, the burn ban issued by the State Department of Natural Resources (DNR) for DNR-protected lands, the current dry conditions, and the recent high temperatures, there is concern about rising fire danger and the well-being of citizens. You are encouraged to be proactive in planning to stay safe in the heat and take appropriate measures to protect your health and homes. There are two different types of burn bans: Fire Safety and Air Quality. Air quality burn bans are issued and enforced by the Puget Sound Clean Air Agency when air pollution levels rise to unhealthy levels, typically in colder fall and winter months. Fire Safety Burn Bans are issued when dryer weather conditions heighten the risk of wildfires. Washington State Fire Departments post fire burn bans. The Shoreline Fire Department issues permits for recreational outdoor / camp fires within city limits. During extreme heat and when fire danger is high, we will not issue these permits. Burning trash, garbage and yard debris is never allowed in Shoreline. Contact the Shoreline Fire Marshal’s Office at 206-533-6565 for more information. Weather advisories and warnings are issued by the National Weather Service. The NWS cautions that during times of extreme heat, you should drink plenty of water, stay hydrated, and be in an air conditioned area, especially if you are susceptible to the heat. As temperatures in inside parked cars can rise very quickly to deadly levels, children and pets should never be left in one. The City’s year-round fireworks ban prohibits the possession, sale and discharge of consumer fireworks. If you observe a fireworks emergency, please call 9-1-1. 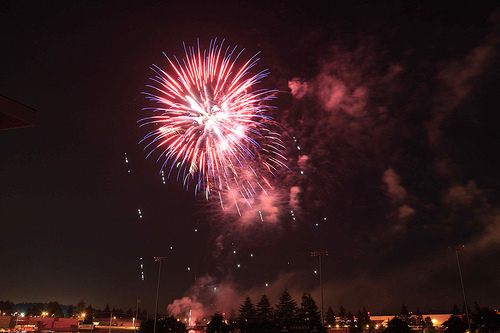 If you want to report fireworks being discharged near your property or in a public park or if you observe fireworks sales within city limits, please contact the NORCOM Dispatch Center at 425-557-5656. Fireworks complaint calls to NORCOM will be prioritized among all other calls for service. Protect your pets over the July 4th weekend. Keep them secured indoors. Loud noises may cause your pet to stray. Please ensure they have two forms of identification (e.g. King County pet license, name tag, microchip) as this will help reunite pets with their owners. If you are looking for your lost pet, visit the Missing Pet Partnership website for advice and assistance, or call Regional Animal Services – King County (RASKC) at 206-296-3936 or PAWS 425.787.2500 for help. With warmer and dryer weather, the Shoreline Fire Department encourages you to help prevent fires. Use caution with any open flame (e.g. barbecue grills, tiki torches, fire pits) and never leave an open flame unattended. Never grill inside. Properly dispose of cigarette butts. Use power equipment safely in dry grass. Were you one of the hundreds of people who enjoyed last summer's production of Into the Woods that the Aurora Theatre Company staged at the Shoreline City Hall outdoor amphitheater? Would you like to see a production this summer? 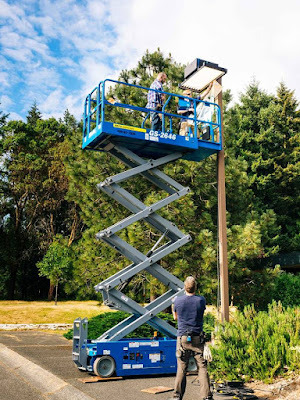 The Aurora Theatre Company discovered last year that outdoor venues require a boost for sound and lighting. 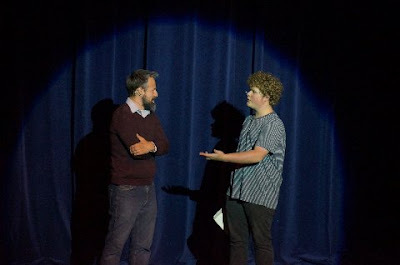 They will be presenting their 2nd Annual Summer Musical - "Fiddler on the Roof" in the same lovely outdoor amphitheatre setting at Shoreline City Hall, July 31 through August 22, 2015. Last year we discovered that performing outdoors presents numerous challenges, the largest being sound and lighting. After all, we want our patrons to see and hear the show! For our production last summer "Into the Woods," we had very minimal sound and lighting equipment. 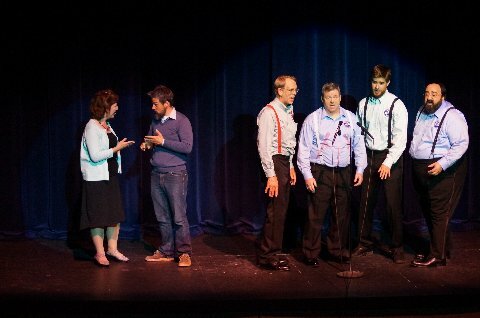 For "Fiddler on the Roof," we have decided to increase all of the technical elements of our show - we will have an actual stage on which to perform, and it will need much better lighting. The cast size has more than doubled, as well, and we want everyone to hear every word of this classic Broadway musical. Good sound and lighting equipment doesn't come cheap and we need your help! Won't you consider making a donation to help bring "Fiddler on the Roof" to life on our stage? Aurora Theatre Company is a 501(c)(3) non-profit arts organization, so every dollar you donate is tax-deductible to the extent of the law. As with our 1st show in 2014, all tickets to "Fiddler on the Roof" are free of charge to the public. We simply ask that you make an advance reservation. After more than 165 days in session, the Governor and Legislature have failed to meet their paramount duty. I urge the Supreme Court to take whatever steps are necessary to bring the Legislature back into session as soon as possible. Rather than address the unconstitutional use of levies to fund our schools, their budget actually increases reliance on levies. The budget includes a long overdue cost-of-living adjustment for teachers and other staff, but only for personnel funded by the state. School districts will be forced to use levy dollars to provide similar increases to staff funded with local funds. And the Legislature has apparently delayed by at least four years the implementation of voter-approved Initiative 1351, which reduces class sizes in grades 4-12 and which is part of the prototypical school model endorsed by the Supreme Court. This budget is not constitutional. Moreover, the Legislature has failed to comply with the order from the Supreme Court to produce a complete plan laying out a pathway to full funding of basic education by 2018. Three years after the Court ruled in McCleary v. Washington, the State of Washington still has no plan to fully fund our schools and end the inequity produced by reliance on local funding. Senators Dammeier, Rivers, Rolfes and Hargrove should receive high commendations for their efforts to address issues key to McCleary, including the need for additional funding. Unfortunately, their hard work was not addressed in this budget. This is no longer just a funding issue – it's a civil rights issue. Students lucky enough to live in wealthy neighborhoods are getting a 21st-century education, while schools in other neighborhoods make do with less. The Governor and Legislature have failed to satisfy the Constitution’s paramount duty. The future of our schools now rests upon what action the Supreme Court will take. I urge the Court to do its duty. 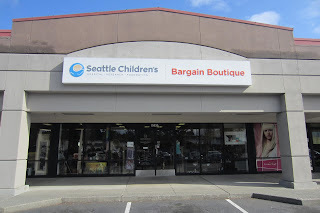 Seattle Children’s Bargain Boutiques exist to provide support for uncompensated care at Seattle Children’s, and to ensure that no child will be turned away because of inability to pay medical costs. To foster this support, our goal is to provide quality new and used merchandise at fair prices in a pleasant environment. 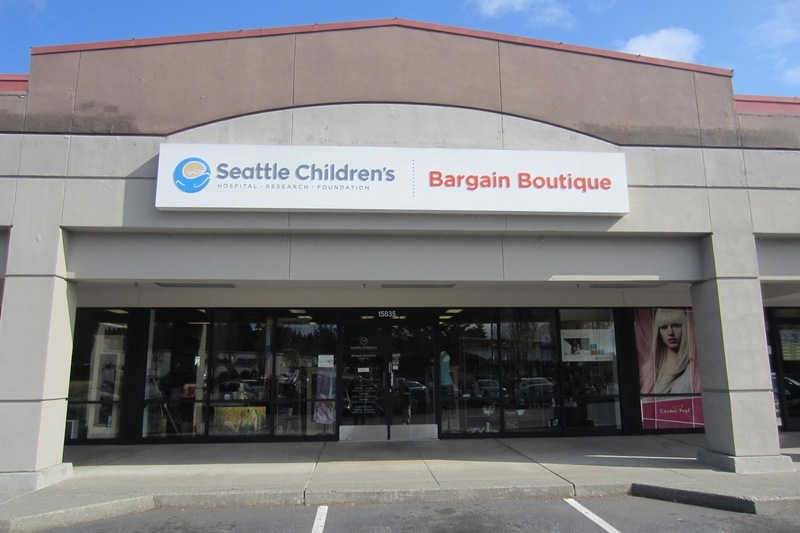 The role of a retail sales associate is to provide excellent customer service to customers, patient families, staff, and donors and maintain steady flow of merchandise to the sales floor to maximize revenue. - Good communication/interpersonal and negotiating skills. - Ability to twist, bend, stretch, reach and stand for extended periods of time. - Ability to climb ladders. - High school graduate or equivalent GED. - Minimum one year of retail experience. - One year of college courses. 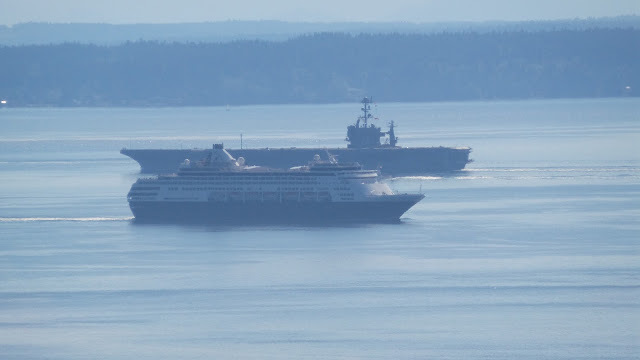 My mind sees a parallel between the conjunction of the planets Venus and Jupiter and that of these two ships that just met at 4:45 on 6-29 off Richmond Beach. Power and pleasure: strength and love; government and the people what could this symbolize. At least no one will postulate the star of Bethlehem for the Statendam (NCL) and the Naval carrier. The drama of the planets will be at its best tomorrow evening. Everette F. "Ted" Baker, Jr 1926-2015 Retired from the U.S. Public Health Service and went to work for King County Health department. Memorial service held at New Hope Church in Shoreline. Lois K. Champion 1935-2015 Spent time as a school nurse in the Shoreline School District. Frank Moll 1934-2015 Shoreline resident and active community volunteer. Joined the Navy after school and was assigned to the Pentagon as an intelligence officer. After three years, he transitioned to the Reserves where he retired with a rank of Captain. Member of local American Legion. "Frank's family was his true love. If his children were involved so was he; be it scouting, school sports, little league, PTA, or band concerts. He enjoyed teaching them how to fish, hunt, and enjoy nature." Philip R. Mylet Age 69 Worked in the Marine Services division of Honeywell. Services at St. Mark Catholic church in Shoreline. Edith B. Rohrback 1926-2015 Services at Calvin Presbyterian Church. Donations may be made to The Pinckney and Edith Rohrback Family Scholarship Endowment through Shoreline Community College Foundation. Judith McCusker, age 70, died in Shoreline on June 3, 2015. She graduated from Shoreline High School in 1963 and then moved to New York City. She lived in Greenwich Village for almost 50 years, working in publishing and administration. Extraordinary tour guide, gourmet chef, hostess, poet, writer, singer, political activist, and many other talents. Lillian Alice Spangler 1934-2015 Worked in various facets of the insurance industry. Mark Strathy 1953-2015 A creative and talented artist, Mark graduated from Shorecrest in 1971, earned a Masters in Fine Arts in 1984 and taught at Central Connecticut University. Elaine Lueck 1929-2015 She and husband Don retired to Shoreline in 1985. She was active in the Shoreline Lady Lions; NW Hospital Speech / Hearing Guild; League of Women Voters Seattle; and the former St. Stephen's Lutheran of Shoreline, WA. Donations may be made to National Jewish Health, 1400 Jackson St., Denver, CO 80206. Richard James Gahen 1944-2015 Richard grew up in Shoreline and graduated from Shoreline High School. Wilhelm T. (Corky) Christensen Age 86 Science teacher for 50 years in Shoreline Schools. Felix "Sammy" V. Samson Funeral mass held at St Luke Catholic Church in Shoreline. David Ross Strecker 1956-2015 Funeral mass celebrated at St Luke Catholic Church in Shoreline. Alice "Dee" Collier Moore 1915-2015 Owner of a chain of TV and appliance stores, including one in Lake Forest Park. Bobbie Maurine Roberts Services held at Shoreline Community Church. Clifford Austin Garl 1914-2015 Born and died in Richmond Beach. He met his wife Lois there when he was a boy. Worked for Standard Oil his entire career, traveling extensively and living in Alaska and California. A swimmer and golfer, he obtained his pilot's license and made his first solo flight at age 91. Evelyn Marie Sparks 1919-2015 Shoreline resident. "Besides her family, she loved dancing and going to the casino. Heaven is probably still rocking from her arrival." Mary Dolores Murphy 1925-2015 She and her family lived in Lake Forest Park and were members of St Mark Catholic Church between 1951 and the early 1960's. Joseph "Jeff" Walters Lewis III 1944-2015 Services were held at the Lake Forest Park Civic Club. Mary E. Underwood Services at St Luke Catholic Church in Shoreline. Otto "George" Wells 32 years in Marines and Coast Guard. During retirement, he played Range Master at Kenmore Gun Range. Member of North Puget Sound Friends of NRA, he taught Hunters Education. Active in Masons, Nile Shriners, and American Legion Post 234. Glenn "Cotty" Edgar Johnstone 1930-2015 Services at Berean Bible Church in Shoreline. Ronald Bernard Hansen 1940-2015 Services will be held on July 11 for former Mayor and Shoreline City Councilman Ron Hansen. He was a long time Rotarian and member of Shoreline Community Church. Dorothy Margaret Knechtel Cathey 1920-2015 Shoreline resident believed in education and worked hard to put all her children through college. Lawrence Joseph Murray Age 70 Graduate of Shoreline Community College, he sailed the world's oceans. Marilyn Urstad 1939-2015 Prayers offered during mass at St Mark Catholic Church in Shoreline. S. Elliott Walters Services at St Barnabas Anglican Church in Shoreline. 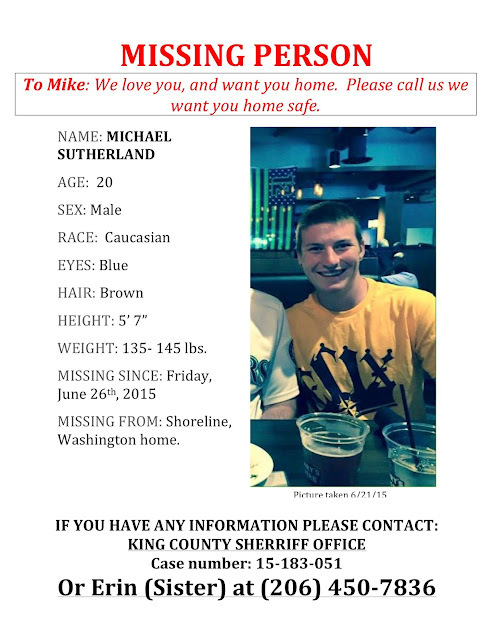 20 year old Shorewood grad Michael Sutherland has been missing for two days now. He was last seen around midnight on Friday at his parents’ house in Shoreline, near Shorewood High School. He is home for the summer from college in Montana and being out of communication with his friends and family is very out of character for him. If anyone has seen him or has any information about his whereabouts, contact either the Shoreline Police Department 9-1-1 or his sister Erin at 206-450-7836. Friends and family met at Shorewood High at noon Monday to hand out flyers in the neighborhood. 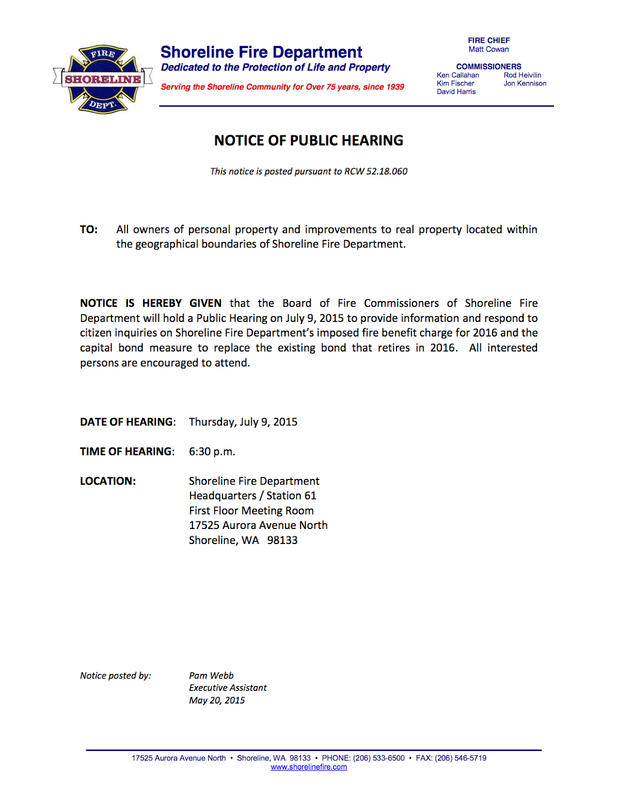 Thursday, July 9, 6:30pm Shoreline Fire Headquarters meeting room 17525 Aurora, public hearing to provide information and respond to citizen inquiries on Shoreline Fire Department’s imposed fire benefit charge for 2016 and the capital bond measure to replace existing bond. For the first time in its short history as a Shoreline City Park, the Kruckeberg Botanic Garden will be closed on July 18th for a ticketed summer event. 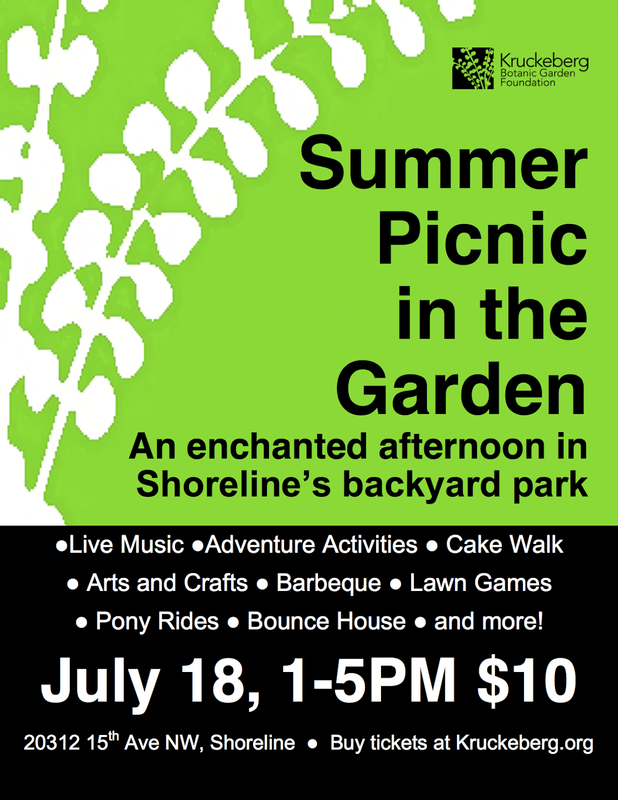 A family-friendly fundraiser, the picnic will feature pony rides, face painting, a barbeque lunch, a bounce house, and craft projects throughout the four acre site. Local artists will be featured and exhibiting home and garden arts, and the MsK Nursery will be selling its rare summer plant collection. The day’s programmed activities include live music featuring the Nyamuziwa Marimba Band, naturalist presentations, a cake walk, balloon toss, and raffle. “The KBGF has always wanted a summer event in the garden, and this year we are proud to be hosting such an opportunity for the community,” Executive director Brianne Zorn said. The art workshops will include creating decorated hats, recreating and coloring Mareen Kruckeberg’s line drawings, and creating plant-etching greeting cards. A plant treasure hunt will give visitors an opportunity to test their knowledge of the garden’s layout, solve riddles, and identify plants around the garden. Dr. Arthur and Mareen Kruckeberg moved to the site in 1958. Since then, the garden has grown to a collection of nearly 3000 species of plants from around the world, including several Washington State Horticultural Society “state champion” trees. Their work developing native and hardy horticulture in the Pacific Northwest continues to influence natural landscape planning across the region. 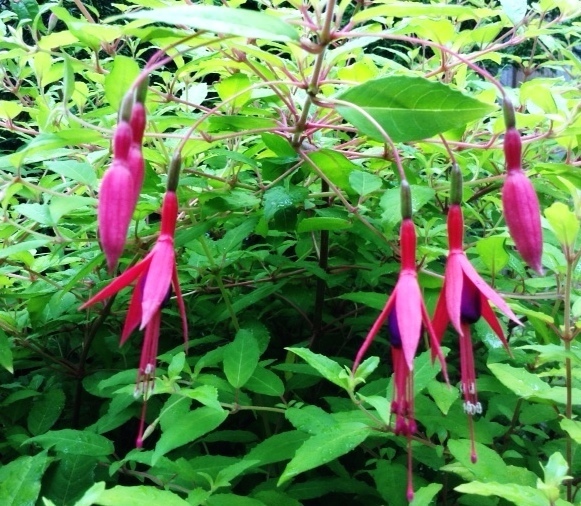 The KGBF promotes horticultural excellence in the Pacific Northwest, and provides high quality education and landscape coaching for local students and gardeners. The event this summer will highlight those achievements while providing fun activities for children and families. Funds raised from the event will be used for seasonal programming and improving the garden’s infrastructure. Curtain call for Seattle Shores, Seattle Seachordsmen and story cast. 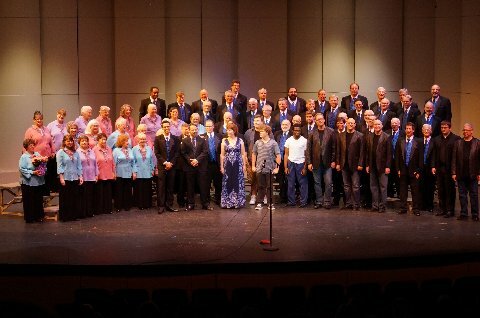 Saturday, June 27, 2015, The Seattle Seachordsmen and Guests performed a "Sleepless In Seattle themed concert at the Shorecrest Performing Arts Theater. The setting for the show: Sam Baldwin (Jon Ross) is working in Chicago after the loss of his wife. His son Jonah (Felix Halvorson) is in Seattle. Sam returns to Seattle and while he and Jonah are talking, Jonah convinces Sam to call Dr. Frasier Crane's radio show for advice. Dr. Crane suggests that Sam go to a meeting of The Seattle Seachordsmen, as involvement with the group will help him with his grief. Sam goes to a meeting and decides to sing with the group. As a newbie he is given the music sheets. Sam and Jacob discuss a job offer Sam has just received which would mean leaving Seattle and a big raise and decide to stay in Seattle and continue singing with the Seachordsmen. Intermission in the story line while the Seattle Shores Chorus sings "Jeepers Creepers" and dancers do a little Jive. Romance blooms! Sam meets Annie Ryan at a Seattle Seachordsmen rehearsal and gets a date. He takes her to the local coffee shop where they are serenaded by The Freshly Brewed Quartet. All ends happily as Sam gets the girl, his son, Seattle - and a good cup of coffee! A number of cities and a few private groups nearby are staging fireworks displays over the 4th (and even later). Here's a selected list. There will be more information on the websites but note the sites are the main city sites - you may have to do some digging to find specifics. As many people know, there are good viewing spots where you are see the fireworks without being on site. For example, the Sheridan Beach group is a private homeowner's group, but there are many viewing areas in the high ground over Lake Washington. From some locations it might be possible to see displays from Kenmore's Log Boom Park or Kirkland as well. 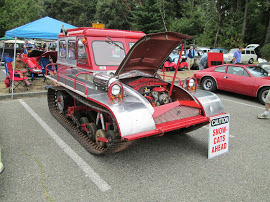 On the west side, many people have secret spots for viewing both the Kingston show and the Edmonds show at the same time. These are from the State Fire Marshall's list, which has every show in the state, hoping that people will go to a show instead of doing their own. The 20th annual Edmonds in Bloom Garden Tour will be held on Sunday, July 19. 2015. 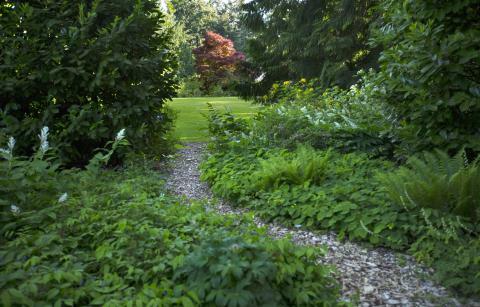 This year’s tour features many of the most beautiful gardens in Edmonds. The 2015 Garden Tour has a full line-up of seven beautiful gardens whose intimate charm and natural beauty speak to the attention lavished on these quiet sanctuaries. 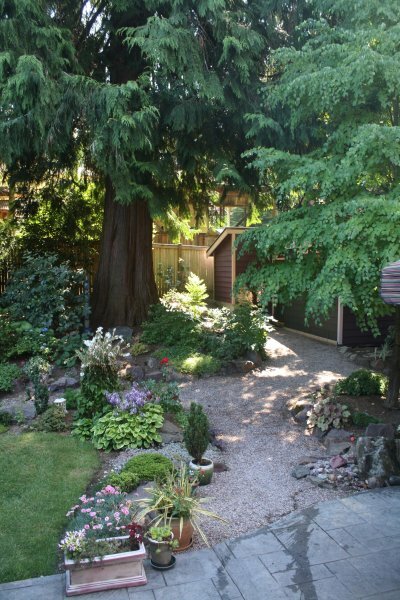 From an art inspired hideaway on a smaller lot, to gardens full of sentiment and healing, a community gathering place, and a garden which also serves as a piece of Edmonds history — the gardens are an incredible representation of the diversity of gardening in our climate. Come feast your eyes. You won't be disappointed. Tickets are sold online and at the following local merchants: Sky Nursery, Garden Gear, Wight’s’ Home and Garden, Bountiful Home and Frances Anderson Center. The cost is $15 in advance or $20 at the first garden on the day of the tour. Edmonds in Bloom is a 501 (c)(3) non-profit organization. Donations are tax deductible. The Richmond Beach Runners Club does a group run from Hamlin park every Wednesday at 6:30pm. This will go through the end of July at least. Park by the baseball fields and start the run at 6:30pm. Runners should arrive 5-10 minutes early to warm-up. Natasha Parman, PT, DPT, OCS, and Meredith Mancuso, PT, DPT, OCS have recently achieved board-certification in Orthopaedic Physical Therapy from the American Board of Physical Therapy Specialties (ABPTS). In July of 2014, there were only 410 PTs with the OCS designation in Washington state. As of May 31, 2015, there were 6,138 licensed PTs in Washington state. To see requirements for testing for specialist certification, visit the ABPTS website. Parman and Mancuso are employed at MOSAIC Physical Therapy in Mountlake Terrace, WA, and are currently accepting new patients. Parman is the Executive Director of the private practice clinic. Parman and Mancuso can be reached at 425-673-5220. MOSAIC Physical Therapy is a therapist owned and operated private practice physical therapy clinic serving the Mountlake Terrace, Edmonds, Shoreline, and Lynnwood communities. Local Shoreline artist Sara Snedecker was selected to create this 100' x 120' public art work on the Sears parking lot near Central Market. The Octopus's Garden is a celebration of all the good things that we enjoy in Shoreline, below and above the water. 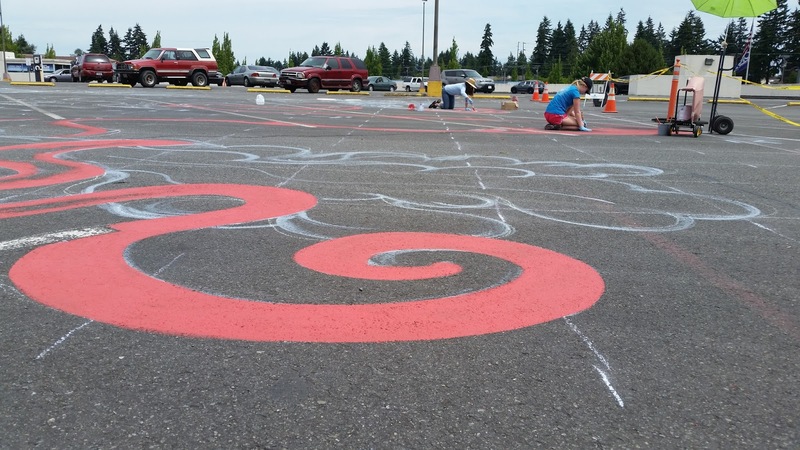 Sara and her Shorecrest High School intern hope to complete the mural by the third or fourth Farmers Market session. Interested art fans are welcome to visit Monday through Thursday this week. 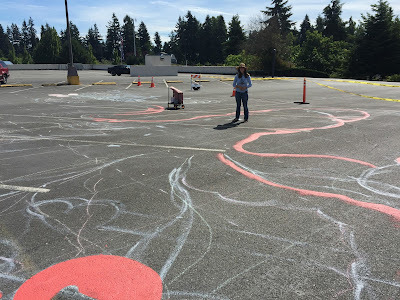 The Octopus's Garden mural and the new location for the Farmers Market is all part of what the City dubs "Phase Zero" of the Aurora Square renewal effort. More information here. Photographers are invited to join the centennial celebration of an historic Seattle garden by using their lenses and competing for the chance to have their impressions published, displayed and archived. The contest is one in a series of activities and events to commemorate the 100th anniversary of Dunn Gardens, one of the most historic and horticulturally significant gardens in the Pacific Northwest. Submissions based on the theme “Timeless visions: Dunn Gardens through the camera lens” will be accepted until October 26, 2015. Both amateur and professional photographers are encouraged to participate. Outdoor digital images may be submitted in two categories – landscape and detail. Photographers may take photos during docent-led tours, special events and open days. Up to three entries in each category plus a caption of up to 50 words may be submitted by contestants. Complete contest rules, criteria and conditions are on the Dunn Gardens website. “We are looking for high quality, striking photographs depicting the garden’s timeless beauty,” said Beth Weir, executive director of Dunn Gardens. She said judges will give preference to photographs that illustrate the historic Olmsted structure and design or highlight the impact of seasonal change on the magnificent garden. 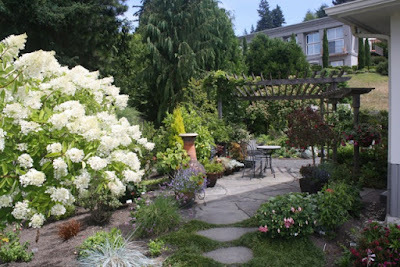 Dunn Gardens, located in Seattle’s Broadview neighborhood, is the only Olmsted-designed private garden in the Pacific Northwest that is open to the public for tours. Once a family’s rural retreat and now a member of the National Registry of Historic Places, this hidden 7.5 acre gem has many distinctive features including deciduous trees , rare seasonal plants, trilliums, a great lawn, water features and a woodland glen of rhododendrons. The Olmsted Brothers believed gardens should be places of respite and are renowned for their ideals of naturalistic groupings of trees. Other Olmsted legacies in Seattle include the boulevard system, numerous parks and playgrounds, the 1909 Alaska-Yukon-Pacific Exposition (credited with shaping the University of Washington campus), and other public and private landscapes, including more than 30 residential grounds. Elsewhere, the Olmsted designs include Central Park in New York, the U.S. Capitol Grounds in Washington D.C., and Boston Commons. Dunn Gardens is part of the E.B. Dunn Historic Garden Trust and supported by volunteers, memberships, donations, fundraising events, tours and other activities. Special events for its centennial, in addition to the photo contest, include lectures by noted garden historians, a Music on the Lawn concert (on July 29) and a Dunnton Abbey garden party (on Aug. 8). Democratic 32nd District State Rep. Ruth Kagi says that the legislature will pass a budget in time to avoid a government shutdown. Kagi, a member of the House Appropriations Committee, said Saturday that she expects the legislature to pass a budget by the Tuesday, June 30, deadline to avoid the state's first-ever government shutdown, including closing state parks and laying off thousands of corrections officers, social workers, park rangers and other government employees. The agreement comes after months of negotiations between the Democratic-controlled House and Republican-controlled Senate and as the legislature began a third special session to pass bills needed to make the agreement work. Kagi, chairwoman of the House committee on early learning and social services, said that she is proud that the budget includes full support for basic education and early learning and "makes much needed investments in our social safety net." The two-year budget would cover July 2015 through June 2017. The 32nd Legislative District includes Shoreline, part of northwest Seattle, Woodway and nearby unincorporated areas, south Edmonds, the whole city of Lynnwood and part of Mountlake Terrace. 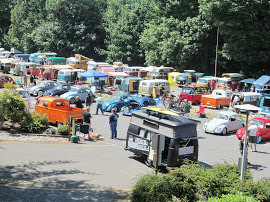 Rain or shine - don't miss the premiere vintage VW show in the Pacific Northwest! 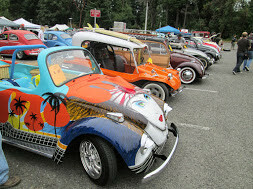 Enjoy our giant Car Show with trophies and Swap Meet for all air cooled VWs. Great fun for the whole family with door prizes and food vendors! General Admission starting at 9:00am is only $5, kids under 10 are free! No additional charge for parking on campus. You don't remember penguins in Aladdin? Then you didn't see the goofy, funny, charming version staged by the Missoula Children's Theater at the Shoreline Arts Festival on Saturday. Missoula sends in a couple of youthful professionals, some costumes and sets. The professionals take some of the lead parts, but they recruit and train upwards of 60 local school kids for the rest of the parts. They are selected on Monday, train for five days, and put on two shows on Saturday. They were all delightful. I think the palm trees had the best lines (multiple puns on dates). The older kids, many of whom have some stage experience from school, were very good. But the little ones stole the show. The penguins really did quite well. 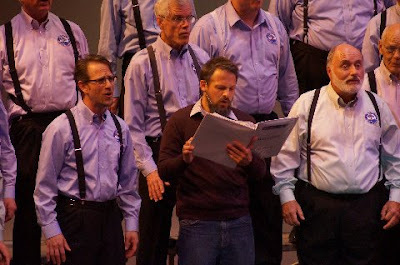 They sang a song early in the production and not only were on key, and on pitch, they were in unison. There were several serious baby hams in the line up - big grins at the audience. Sometimes one would be a little behind the others in the many arm gestures (slapping their wings to the sides of the heads and calling out "Lost! Lost!"). Occasionally one would turn the wrong way or forget to leave the stage because they were so busy posing for the audience. I noticed more than one dad in the audience with bouquets of flowers for their young actor. The Donkey, played by Harper Flynt and one of the young genies, played by Jessica Yost, Jared Yost, and Lexi Burke, were outstanding. 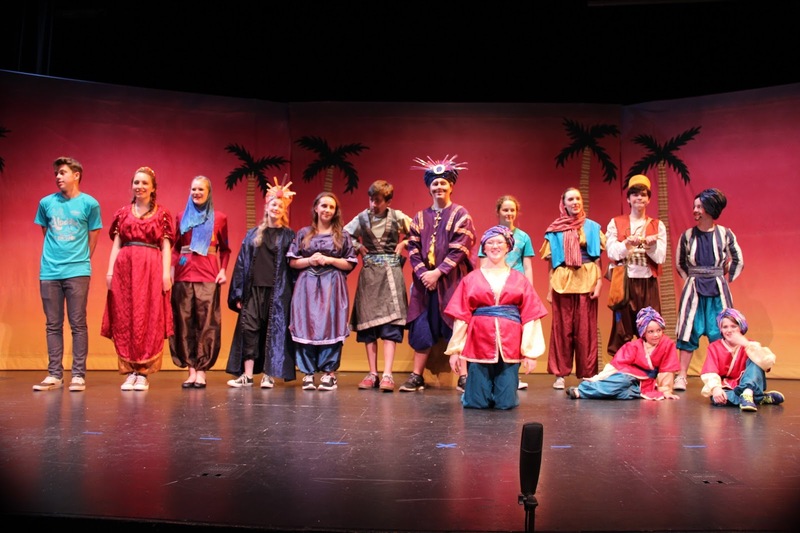 Penguins were played by Jossalyn Acacio, Rosie Cameron, Cedella Dean, Hartley Kropf, Jason Logan, Makenna Louch, Carly Lukson, Iris Sottile, Kaline Suiter, Molly Valderas, Hazel Zackey, and Noan Ziz. 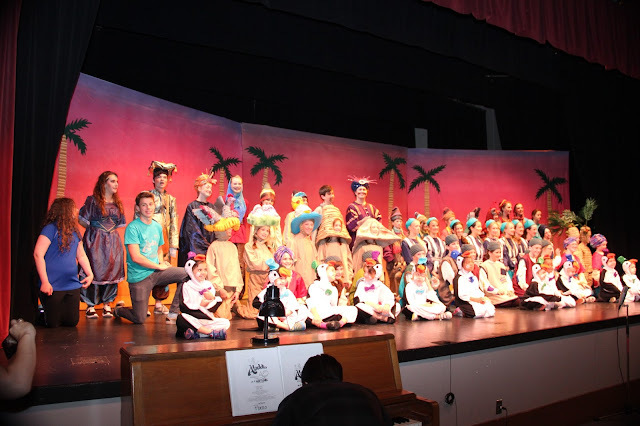 Aladdin was played by Shane Baden, who, at the end, was successful in getting the Princess (Madison Lathrop) to go to the Prom with him. 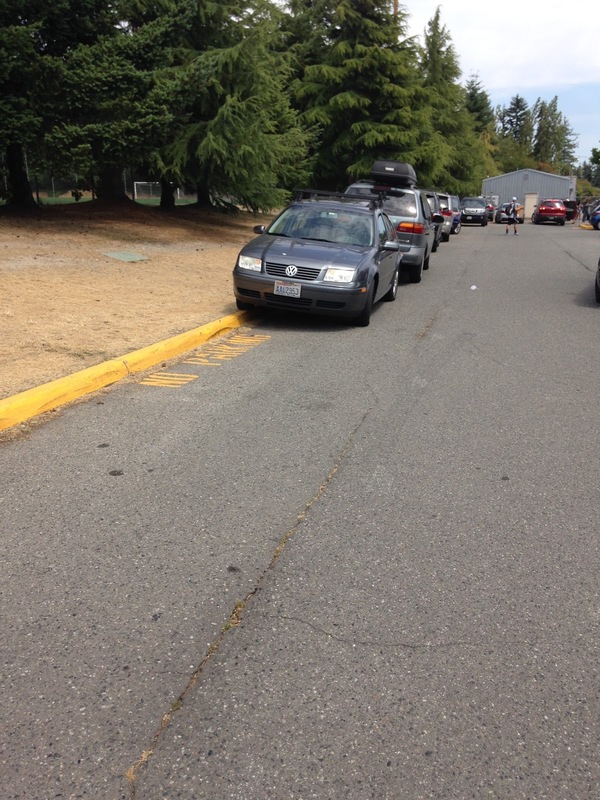 Parking is often tough around the Shoreline Center, especially when there are major soccer events. The Shoreline Arts Festival patrons took a lot of spaces today, in spite of the shuttle service from Meridian Park and the Courthouse. However, parking in fire lanes is a bad idea. And giant yellow letters that say "No Parking" are not exactly subtle. Two of the fire lanes were fully parked over today, including cars parked over the curb. Just plan to leave a little earlier and drive a little farther to find a legal space. We'll all be glad for this when the fire department needs to get through. If you want to be a real-estate photographer, get to know a listing agent. The listing agent is the seller's agent. The buyer’s agent has no interest in your photography services. Perhaps the best place to meet the listing agent is during a weekend open house. Most of the day they are sitting around waiting for someone to walk in and if no one is there, most will be happy to chat. Offer to do a shoot free. You can use the images for your portfolio. Another option is to contract the broker at the office the listing agent is attached to. You can ask if you can give a presentation on real estate photography at one of their meetings. Learn all you need to know for a presentation in two downloadable books by Larry Lohrman: Photography for Real Estate and Business of Real Estate Photography. Most of the information in these two books can be found on his blog. This is The Place to hang out for real estate photography. If you are starting out and need the basics, go to: The Real Estate Photography 101 Category. Photography For Real Estate Flickr group is where group members post images to the group photo discussion area and give feedback to each other and carry on group discussions. It is like attending a free 24/7 real-estate photography workshop with the best real-estate photographers around. Even for a large room, a wide angle lens allows you to fill the frame with the room. A popular lens for real-estate photography for the Cannon camera is the 10 - 18mm lens ( about $249 ) on Amazon. I use a Tokina 11 - 16mm lens ( about $440 ) because of the wide 2.8 aperture. I love the ability to open the lens wide to achieve bokeh, where everything is blurred but the subject, because I use this lens for many projects besides real estate. Some photographers use small speedlight off-camera flash. Flash gives the room a bright sunlit consistent color. An HDR capture without flash may likely have a warmer ambience. But if you don't like the warm colors generated without flash, you can adjust in post processing. I took three to five exposures for each room and put them together in an HDR program called Photomatix. It is not a hard program to work with and once you get the hang of it, it is addictive. You can create warm colors as I've done in these two images, or you can go for a surrealistic effect. 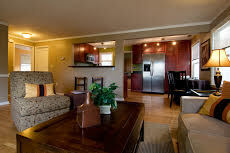 For real estate images, though, you want to keep images looking real and untouched as possible. One of the largest U.S. companies hiring real-estate photographers is right here in Seattle. Vicaso supplies the real-estate clients, paying you to go out and do the shoot. You choose how many hours per week. No post processing is necessary. Fill out their online application. Update: Original article did not have the smaller house photo.